I had ridden out of Churchville, Virginia in early May of 2002, headed for Oregon and the Pacific ocean. A few days, and more than a few miles, now lay behind me and my mustang, Apache. But now it was Saturday and I woke up to the aroma of what was a familiar smell since the beginning of my ride – truck-stop coffee! As the memory of where I was became clear, I was suddenly more eager to get up. The truck-stop across the field held the anticipation of the steaming hot addiction that I was missing. I had slept well last night. My saddle had become my pillow and was a surprising comfort. But as soon as I unzipped my dew-covered sleeping bag, the very first thing I did was put baby powder on my feet. I was hoping to help the blisters I had gotten yesterday by walking part of the way next to Apache. With my feet dusted and my boots on, I hung up the sleeping bag on a tree branch so it could dry. Then I limped over to where the tough little mustang gelding was standing. I greeted him with his usual “Good Morning” rub on the neck. Apache barely noticed. The five year old mustang was restless because he had eaten all the grass in the limited grazing area left to him last night. Well luckily I had thought of that the night before. I led him over to an untouched area I had picked out for his breakfast when we rode up yesterday, then tied him up, double-checking to make sure there would be no way he could get away. With Apache’s nose in his morning grass, my own nose reminded me of that hot coffee. It was only a short walk across the field to the truck-stop but my walk was unsteady from my sore and blistered feet. No matter, I felt better than most mornings. Guess I still felt fresh from the truck-stop shower I’d taken the night before. Clean or not, I wanted breakfast and the bigger the better. It didn’t take me a minute to reach the restaurant. Yet when I did I was aware of the odd feeling that hung over me. I had been driving trucks across the USA for 28 years, probably had three million miles under my belt, had most likely been in 25,000 truck stops just like this one since I started driving the big freeway rigs when I was only 18 years old. But this was the first time I had been in a truck-stop with a horse, not a truck, under me! Just before I opened the restaurant door I glanced back at Apache, then walked in like I had done so many times before. I sat down in a booth, but that cup of welcome coffee got delayed one more time when a morning-shift waitress walked up and said, “Are you the guy with the horse”? “That’s me,” I answered with a laugh, amazed at the talk and attention my little journey was already attracting. Introductions over, I ordered a big stack of pancakes, said throw in a ham and cheese omelet to be sure, and cautioned her not to forget some rye toast. “And how about coffee”? she asked. When she put the hot food before me, I started to eat that breakfast like I had never tasted food before. Living in the saddle does that to a man, makes him hungry for real food and real life. I had barely polished the plate with the last of the rye toast, when the cook and his dishwasher came out to see this guy with the horse that the waitress kept talking about. Both guys began asking the questions I was getting used to hearing. “How far away is that”? “How long will it take you to get there”? “About four months, if I hurry up and finish this cup of coffee”. “Why are you doing it”? “When I was twelve-years-old, I got the crazy idea of riding from our home in Colorado, all the way to South Dakota. Never followed up on that dream, until now. Then I decided to do it right and ride from coast to coast”. Their interest, and that big breakfast, had started to ease me into a good mood. I could tell because my smart-assed sense of humour came back when the dishwasher finally said, “You know, it’s supposed to rain today. What do you do when it rains”? “Get wet,” was my reply. I had finished up the coffee, paid my bill, and turned to go, when the waitress shyly asked, “Are we going to get to see the horse“? “Sure. I’ll be right back” I told her and her two friends, then limped back towards Apache and the start of another day. Saddling up took only a few minutes when you travel as light as I do. 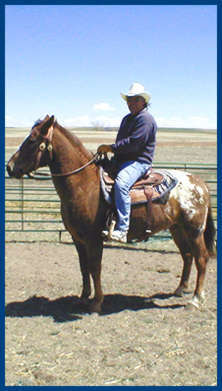 With the reins in my hand and the horse behind me, Apache and I made our way out of the field towards the truck stop. Even though there were a line of long eighteen wheelers parked at the fuel island, we sauntered right towards them. But we needed water, not diesel. I wanted to fill up Apache’s pickle jar water bucket before leaving. “We don’t want to run out of water,” I told my mustang buddy. Boy, considering what we were about to live through, water was the last thing me and Apache needed that day. No matter, I had a blast pulling Apache up to the 10-bay fuel island where a line of big trucks were guzzling diesel fuel. But we made our way to the water spigot at the end, ignoring the fuel pumps. With Apache patiently looking on, I began to fill his water jug. An owner-operator with a nice Peterbilt truck was filling up his chrome wheeled baby next to us. I took one look at the difference in our mounts and then couldn’t resist. “Bet my bill will be cheaper than yours!” I said with a grin. “Yeah, looks like a lot more fun too!” he added. We talked a few minutes about trucks and the life of a cross-country driver, then Apache and I made our way back towards the restaurant and the patiently waiting waitress.